Barbut, J. & Lalanne-Cassou, B. 2010. 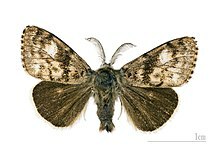 Contribution to the knowledge of Erebidae from French Guiana: description of five new species (Lepidoptera: Noctuoidea). Bulletin de la Société Entomologique de France 115(4): 435–444. Poole, R.W. 1989. Lepidopterorum Catalogus New Series Noctuidae Part 1. Fascicle 118: 3–500. Volynkin, A.V., Dubatolov, V.V. & Kishida, Y. 2017. Barsura Volynkin, Dubatolov & Kishida, gen. nov., with descriptions of three new species (Lepidoptera, Erebidae, Arctiinae). Zootaxa 4299(1): 54–74. doi: 10.11646/zootaxa.4299.1.2. Reference page. Witt, T.J. & Ronkay, L. 2011 Lymantriinae and Arctiinae – Including Phylogeny and Check List of the Quadrifid Noctuoidea of Europe. Noctuidae Europaeae Volume 13: 1–448.